When you’re done with PS4-exclusive Detroit: Become Human’s lengthy story, the game asks you if any of its moments resonated with you. For us, almost all of it’s near sci-fi tale did, albeit for all the wrong reasons. Developed by French studio Quantic Dream whose previous work includes adventure titles like Heavy Rain and Beyond Two Souls, it’s a narrative-driven game where the plot takes precedence over everything else. And while the other two had some intriguing twists you likely didn't see coming, Detroit: Become Human’s futuristic trappings do little to hide its big reveals which can be seen coming a mile away. Set in a world where the US is at odds with Russia, self-driving cars don’t crash, and most jobs have been taken by robotic androids, Detroit: Become Human has you switching between Connor, Kara, and Markus. They’re three androids all with very different objectives. Connor was created with the sole purpose of hunting down rogue androids, or deviants as they’re known for turning on their human masters. Kara’s objective is to escape the city with Alice, a small human girl in her care. Markus is the leader of an Android uprising, fighting for the same rights and freedoms for his kind that humanity enjoys. 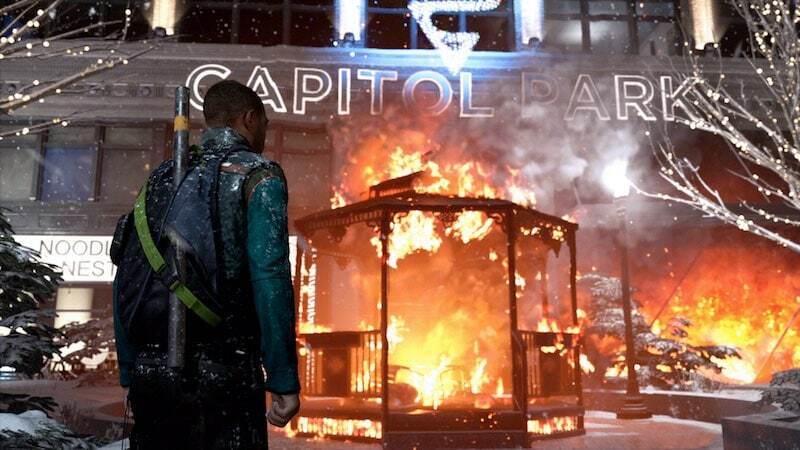 Despite starting with a bang — having you in the role of Connor negotiating with a deviant holding a child at gunpoint on a building rooftop — Detroit: Become Human quickly settles into a slow burn. As Kara, you’ll clean a house and do laundry while Markus’ arc begins with the mundane task of buying paint from a store. While these chapters exist to give you an idea of the game’s world and the motivation of its characters, it makes it a bit of a chore early on. So much so that we preferred Connor’s story arc over the other two due to the interesting scenarios you find yourself in. From tracking down deviants with a fetish for pigeons to dealing with Hank Anderson, grizzled human detective partner, events of Connor’s chapters stand out compared to the menial busywork of playing as Kara or Markus. Even when the other two’s narratives finally fire on all cylinders, they don’t feel as polished, memorable, or entertaining as Connor’s and are the most predictable segments of the bunch. Which is saying a lot since Connor’s arc appears to be heavily inspired by the works of Isaac Asimov — I, Robot and The Caves of Steel in particular — making how it will play out rather obvious. However Detroit: Become Human isn’t without its merits. There are elements of gameplay not too dissimilar to Telltale’s adventure games like Batman and Guardians of the Galaxy, so there’s no learning curve or fancy new control schemes to learn. You’ll press buttons indicated on the screen to perform actions - depending on whose arc you’re playing, this could be anything from washing dishes to choosing the right words to incite an android rebellion, each with different consequences leading to varied outcomes. Compared to Quantic Dreams’ last two games, the aforementioned Heavy Rain and Beyond Two Souls, it’s easy to pull off Detroit: Become Human’s many button prompts and half circle analogue stick movements. It sticks to a control scheme that’s similar to the other two games, but the added polish and refinement makes it far from awkward. The controls feel just right. Coupled with smooth animations, it even makes lightning fast action sequences a joy to pull off towards the end of the game. Furthermore, at the end of each chapter you see a flowchart of your decisions. It makes you aware of what you’ve done and what you could have done, tempting you into another playthrough with the promise of in-game currency or points that you can use to unlock content such as the game’s soundtrack, early sketches, character backgrounds, and so on. It’s a bold move as it lays the entire story bare, right down to the smallest decision. Quantic Dream hopes it’ll bring completionists back, though to us, it seems like a studio is being transparent about the limitations and scope of the game. In an industry fuelled by hype, keeping your expectations in check seems like a welcome change. In addition to this, Detroit: Become Human looks great. Be it highly detailed facial expressions on humans and androids or slick lighting effects and reflections, it’s a treat to look at on the PS4 Pro. Backed up by a fantastic soundtrack and voice acting that feels genuine and you have a title with stellar production values. That said, these additions do little to enhance a derivative story. Most choices or actions are essentially binary, forcing you to choose between usual video game tropes such as non-violent and pacifist options or prioritising capturing a deviant over saving a loved one. It doesn’t help that most characters you interact with feel one dimensional and easy to read, making it simple to gain an outcome you desire. Clocking in at around 25 hours, it’s not a short game by any means and it could go up to 40 hours should you decide to complete everything, though not all of it is as good as it could be. Overall, Detroit: Become Human is a gorgeous game that brings some welcome improvements over Quantic Dream’s earlier work, but one that is ultimately flawed due to its predictable plot. Gadgets 360 played a review copy of Detroit: Become Human on the PS4 Pro. The game is out on May 25 priced at $60 in the US and Rs. 3,999 in India. product PS4-exclusive Detroit: Become Human has androids, sci-fi, and a lot of stories to tell. But it could be better. Find out why in our Detroit: Become Human review.